In this tutorial, I’m going to show how to make android sliding menu with WebView. Android WebView is a View that displays any website to your android application. You can also find many android navigation drawer view libraries in the internet and you can find many android WebView tutorials at Android WebView Tutorial with Example. Let’s start by creating a new android project to make Android Sliding Menu with WebView with the following information. Add design support library dependency in your build.gradle file which looks like this. Add colorPrimary, colorPrimaryDark and change your app theme. The final code of your styles.xml file looks like this. And also create colors.xml file in your value directory and add following colors. To add menu items, you have to create navigation_items.xml file in your menu directory. And also add following strings in your strings.xml file. Following is the final code of your activity_main.xml file. Your MainActivity.java file looks like this. After Creating ViralAndroidActivity.java and GoogleActivity.java file, add following code. Following is the final xml code of viral_android.xml and google.xml file. You have to add internet permission in AndroidManifest.xml file of your application. Following is the final modified code of AndroidManifest.xml file. And default code of menu_main.xml file looks like this. Don’t forget to add sliding menu icon in your drawable folder. That’s it. 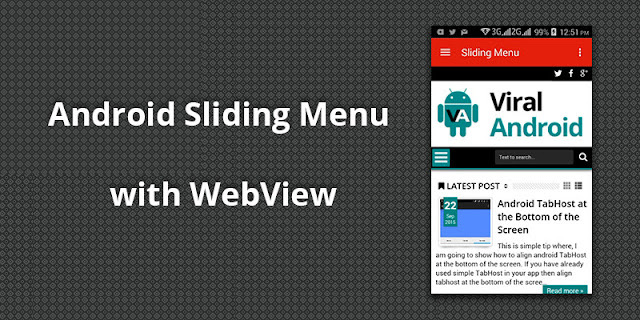 Now, run your Sliding Menu with WebView application. Download complete Android Sliding Menu with WebView example project source code from GitHub.